The Web has become such a force in commerce and culture that a group of leading university researchers now deems it worthy of its own field of study. 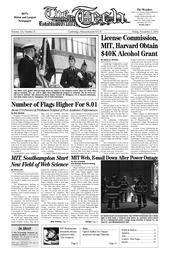 The Massachusetts Institute of Technology and the University of Southampton in Britain plan to announce on Thursday that they are starting a joint research program in Web science. Tim Berners-Lee, who invented the Web’s basic software, is leading the program. An Oxford-educated Englishman, Berners-Lee is a senior researcher at MIT, a professor at the University of Southampton and the director of the World Wide Web Consortium, an Internet standards-setting organization. Web science, the researchers say, has social and engineering dimensions. It extends well beyond traditional computer science, they say, to include the emerging research in social networks and the social sciences that is being used to study how people behave on the Web. And Web science, they add, shifts the center of gravity in engineering research from how a single computer works to how huge decentralized Web systems work. The Web science program is an academic effort, but corporate technology executives and computer scientists said the research could greatly influence Web-based businesses. They pointed in particular to research by Berners-Lee and others to build more “intelligence” into the Web -- moving toward what is known as the Semantic Web — as an area of study that could yield a big payoff. Web science is related to another emerging interdisciplinary field called services science. This is the study of how to use computing, collaborative networks and knowledge in disciplines ranging from economics to anthropology to lift productivity and develop new products in the services sector, which represents about three-fourths of the United States economy. Services science research is being supported by technology companies like I.B.M., Accenture and Hewlett-Packard, and by the National Science Foundation. Berners-Lee and his colleagues at the MIT Computer Science and Artificial Intelligence Lab and in Britain have had preliminary discussions with government agencies in the United States and Europe that finance scientific research, as well as with leading technology companies. But Berners-Lee said his group had decided to publicly circulate their ideas about Web science before trying to attract government, foundation and corporate funding. The MIT-Southampton partnership, the researchers emphasized, is intended as a catalyst for Web science research at universities worldwide. Privacy, for example, will be one area of research in Web science. The traditional approach to protecting privacy has been to restrict access to databases containing personal information. But so much personal information is already available on the Web, often given voluntarily on sites like MySpace and Facebook, that the old approach will not work, said Daniel J. Weitzner, technology and society director at the Web consortium. On the Web, Weitzner said, a better way to try to guard privacy may be to develop rules, backed by accountability and sanctions, for how personal information is used by businesses, government agencies and individuals.